Opened in June 2017 the Foresight GC2 Simulator is situated in our newly re-furbished professional shop. 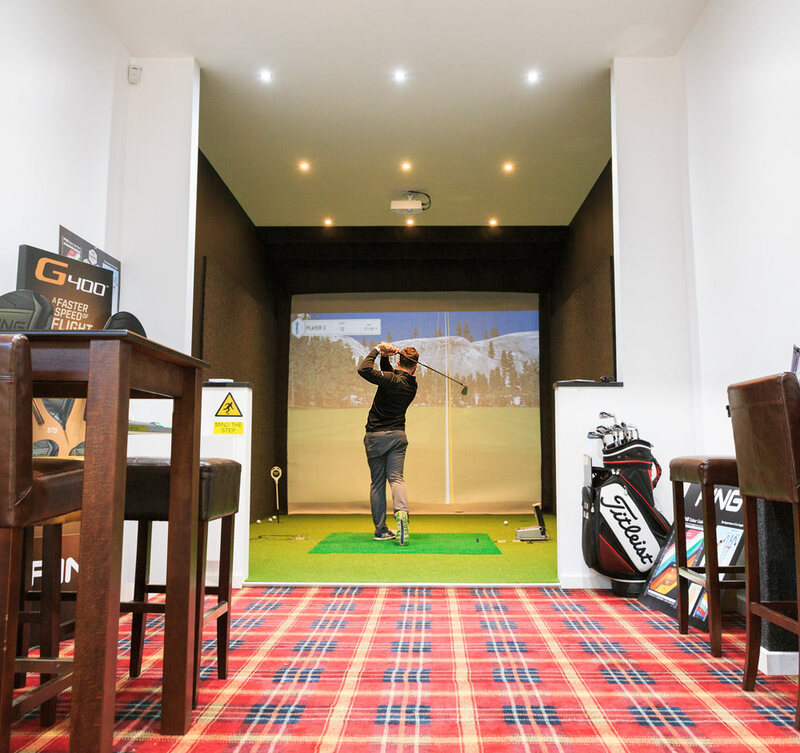 Come and take the opportunity to play some of the worlds top courses, in the comfort of our private simulator room. Tea, Coffee and Alcoholic Beverages can be served along with your bacon rolls, and other snacks. The GC2 incorporates a launch monitor, projector, screen, and booth (as seen on sky sports golf). The unit takes images of the golf ball in flight and provides an array of data values that contribute to the ball flight that is then displayed on the screen. Then our PGA qualified professionals utilise the data to help you improve your game. “The use of this technology can hugely accelerate development of the golf swing and helps people get better quicker – I wouldn’t be without this for coaching.” – Dylan Williams PGA Director of Golf. The P&K Simulator offers a range of options for both improving your game or simply having a good time with friends. The entertainment function allows players to play a wide variety of different golf courses throughout the world. Included in the basic package price are 8 different golf course, including Royal Birkdale, Wentworth, Celtic Manor Resort 2010 Course. Always popular amongst visiting societies. Challenge your friends to a nearest to the pin competition at Royal Birkdale or see who actually is the Longest hitter in the group with a long drive competition! Maximise your improvement by utilising the GC2 in a lesson with our PGA Professionals. Our Professionals Dylan & Huw will provide you with feedback on your ball flight and how your swing causes it. They will also provide you with key performance indicator's (KPI's) to use in an indivudal practice session on the simulator to make your practice as rewarding and purposeful as possible! Is your equipment helping you or hindering you?! Find out now by booking in for a club or ball fitting to find the equipment that will most benefit your game! All club purchases are accompanied with a free fitting session to ensure the equipment suits your game. Includes a range of products and brands including Titleist, Callaway, Ping & Lynx Golf. • Teams of 3 best 2 scores each hole to count. • Find more fairways and yards through technique and club delivery, focusing on your spin rates and launch angle. • Get the perfect setting on your driver. • Play 60 shots from a variety of yardages for a full analysis. • Get the GC2 Report from your session. • Get your distance control and highlight your yardages. • Targeted action plan to improve your weak points. • Get advice on your wedge configuration. The Golf Simulator is open to the public and fully equipped with Titleist Clubs and is available for hire by contacting the Proshop team on 01656 783093 Ext 2. Bookings must be made 48hrs in advance.